While the exact definition of what makes a “casual game” varies, everyone knows one when they see one. They’re the games you play on your Android tablet when you’re bored. They’re the games you can play on your Android phone during your break. They’re your gateway drug to more challenging games. These are the small games that you can easily pick up and put down. But we have discovered a casual game that is not that easy to put down, an Android game called Hypno Rings. The developer team over at PopSoda Digital Commerce did a great job in making addictive casual gameplay presented with appealing design and fun music and sound effects. Also, it can be played on both phones and tablets. The gameplay features simple, yet challenging goal. You have to match the rings (just follow the instructions at the beginning) and earn higher points. Match as many as you can and reach 35 points to get all of the integrated ads disabled. 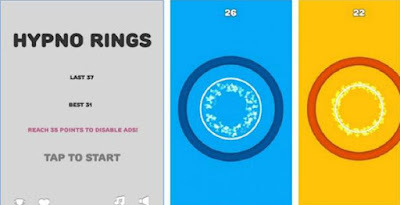 Just tap on your display and don’t get hypnotized by the rings and the 5 captivating soundtracks because you will lose the game. But even if you do, you can always press restart and play again. Share the fun with your friends and download Hypno Rings for free from Google Play.